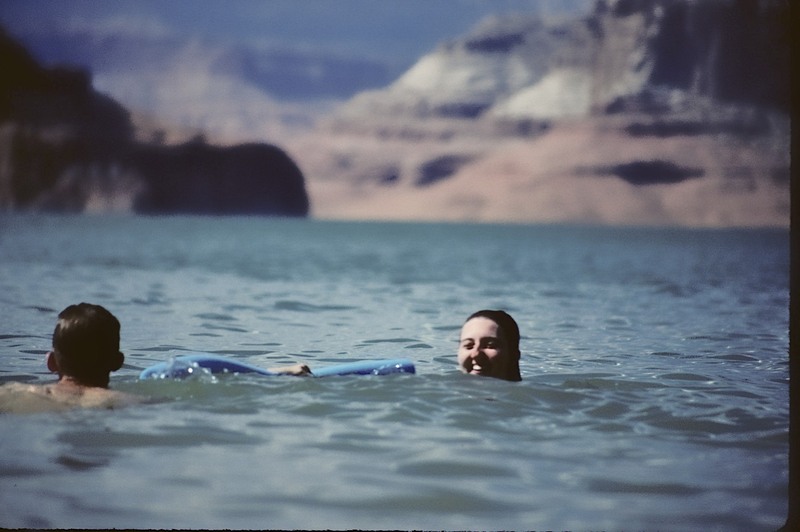 Posting this in N.J. on a windy, cold day (wind chill: zero F (-18 C)) brings these warmer images to mind, part of a southwest (U.S.) vacation some time ago when we rented a small boat and explored a number of the 190 spectacular winding sandstone canyons of (man-made) Lake Powell, and swam in it’s deep blue waters. 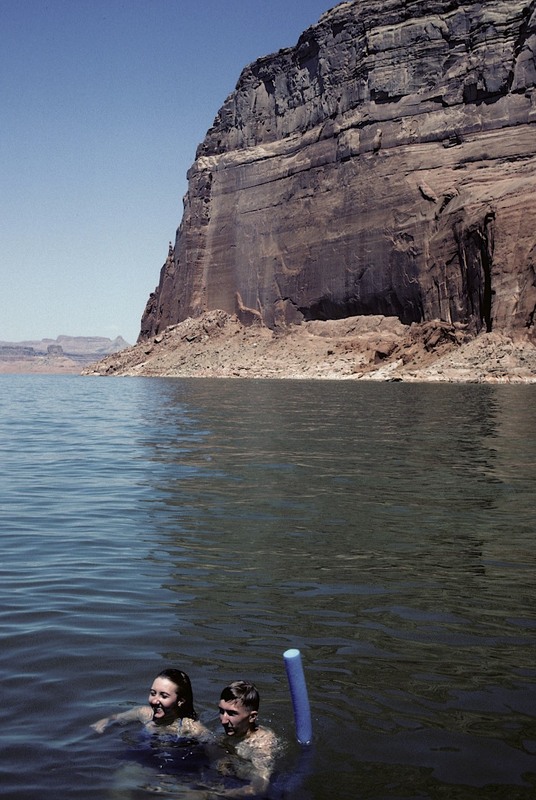 The “noodle” was a good idea as the waters are over 500′ (152m) deep in places. 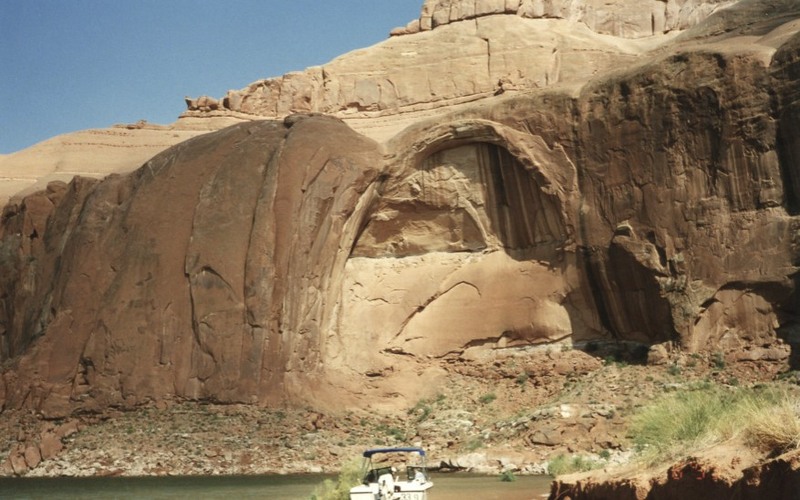 The entrance to Forbiding Canyon is some 60 statute miles (96 km) east of Wahweap Marina. 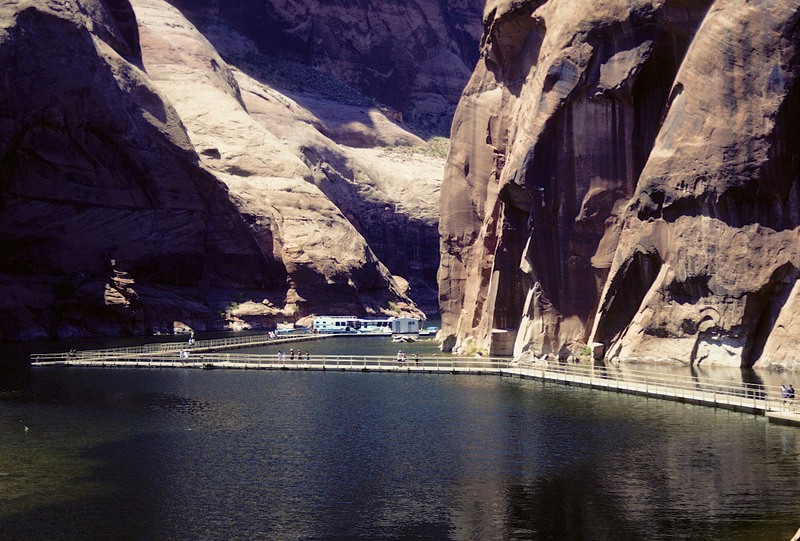 About five incredibly beautiful miles further, are the Rainbow Bridge boat docks. Small boats and houseboats provide the only reasonable access to Rainbow Bridge. Just after approaching between towering cliffs, the natural sandstone arch, which IS Rainbow Bridge, can be seen here to the left. 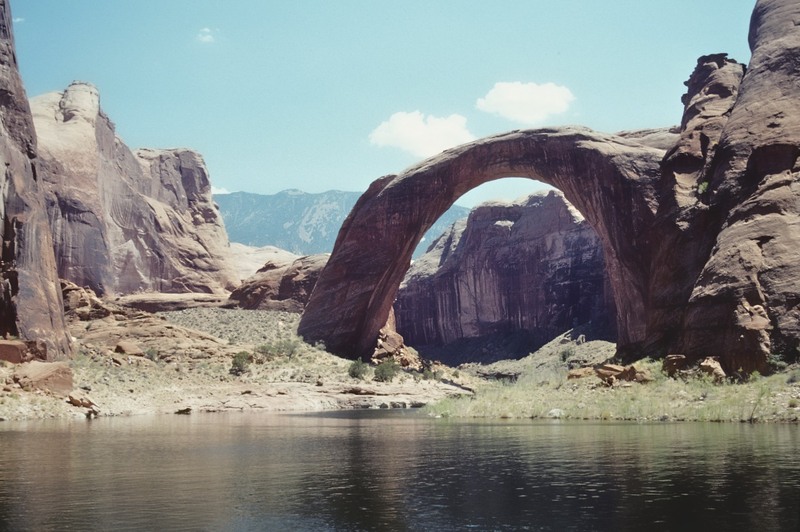 Rainbow Bridge, 580′ (177m high, is one of the worlds largest natural arches, basically inaccessible by car. 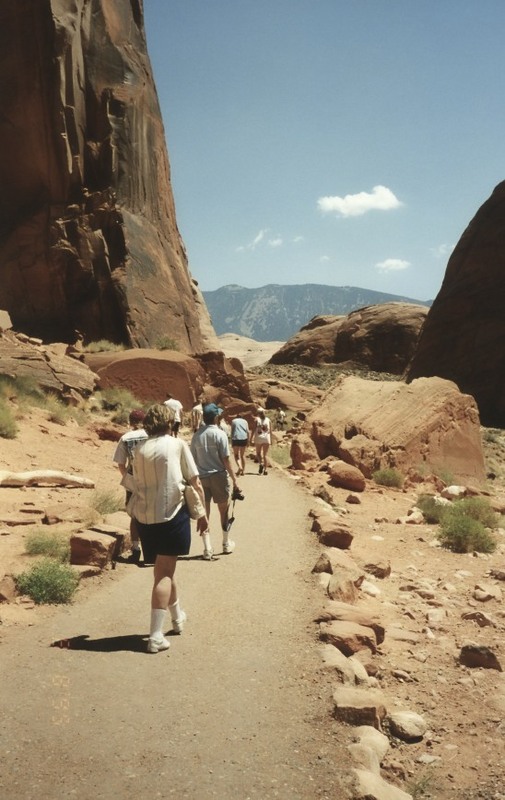 Once docked, there is a short but warm hike to the arch. Below: It’s awesome. 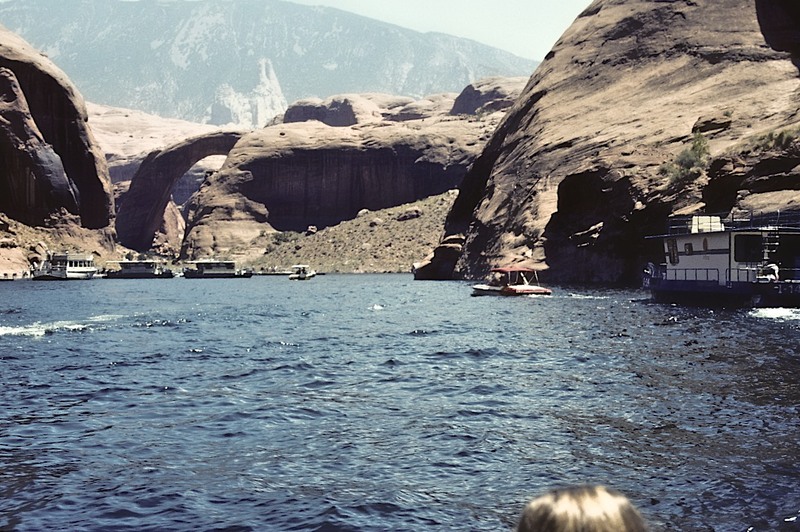 Only after the Glen Canyon Dam was completed in 1963, and the Colorado River flooded, was Rainbow Bridge accessible for most. Back in the boat, we headed out and had lunch in narrow seclusion among towering formations, affording shade from the hot sun. Although we would boat about 140 miles round trip today (225 km,) we never tired of the remarkable scenery, allowing stops for exploring and swimming. 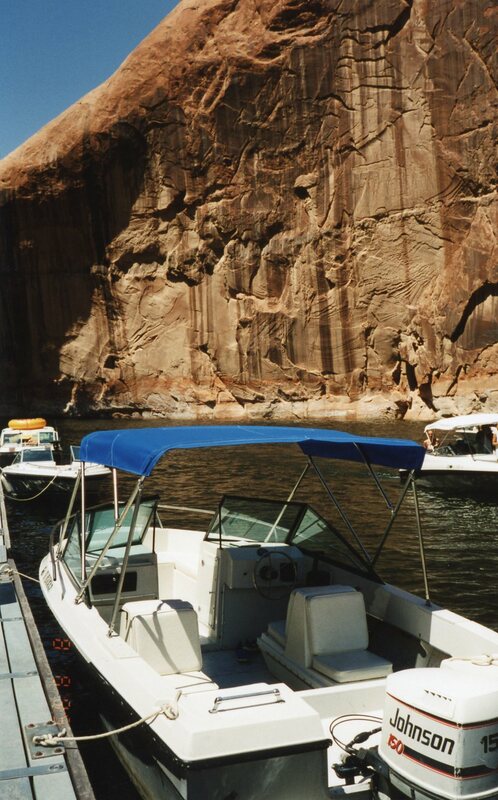 House boats and other watercraft rentals are available throughout most of the year on Lake Powell, the “reservoir” located mostly just above the Arizona State line, as seen in the satelite photo and maps below. Forbidding Canyon. The main lake is above this section, out of the picture above; and Rainbow Bridge would be just out of the picture, below the dockage area at the lower right. 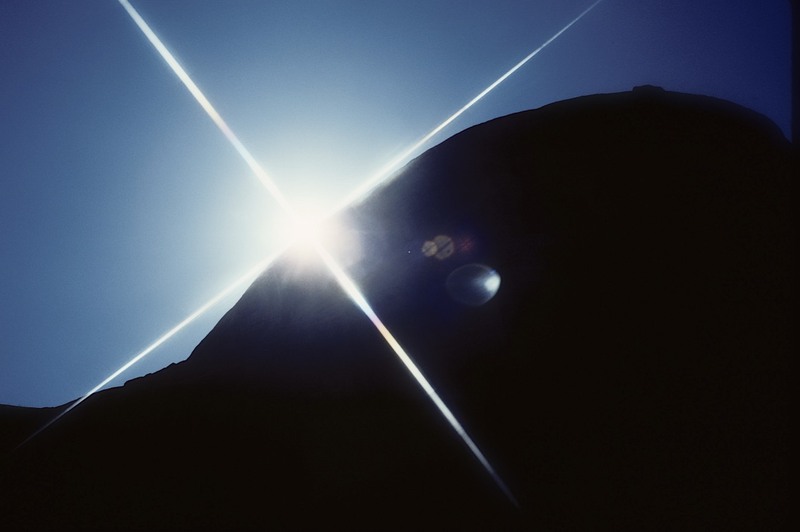 This image is about 2.5 miles (4 km) wide. 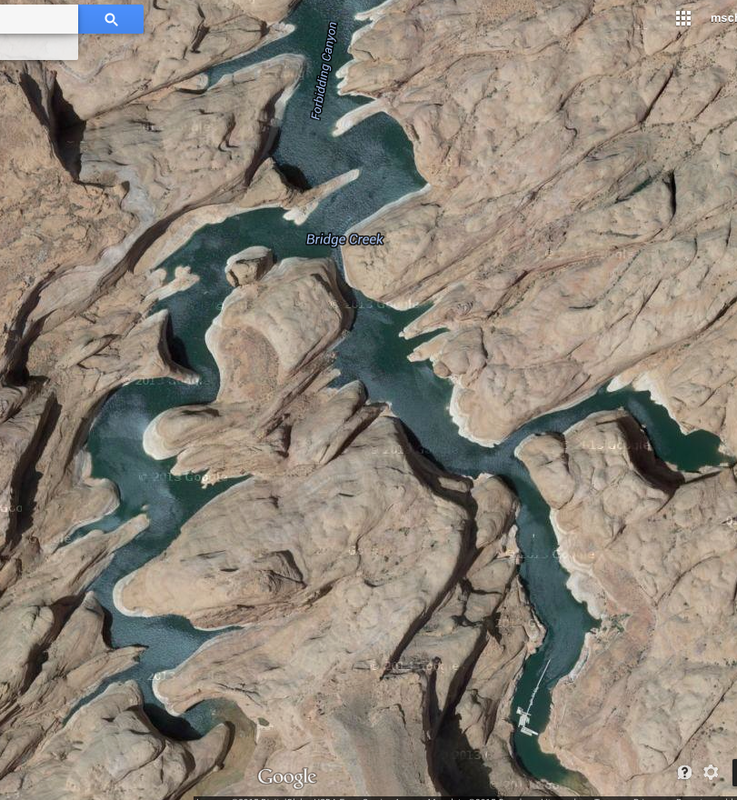 Below, Lake Powell, from Google Maps. Wahweap to the left, Rainbow Bridge to the right. That is an awesome arch . . . and I did not think about boat rentals when we drove through the area. Then again, I know little about boats. Those walls look impressive from the surrounding areas (them that can be seen), but seem much more so from water-level. Thank You showing these photos. 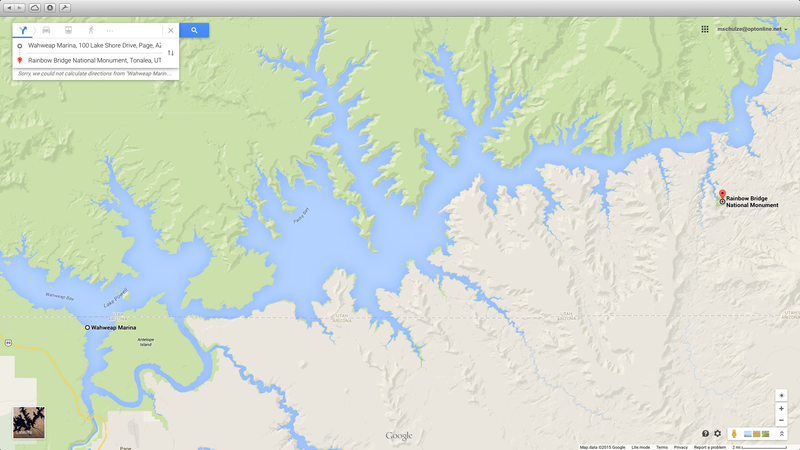 The area is totally unknown to me.